The Rotary cooking/serving crew--Jane and Chuck Veeder, Corina Larsen, Steve Russell, Steve Johnston, Tamara Saarinen, Izzy Larsen, and Josh Hamilton. Not present for photo: Lisa Gallant and her sister Terri and Frank Greenleaf. Photo by Dave Wollstadt. 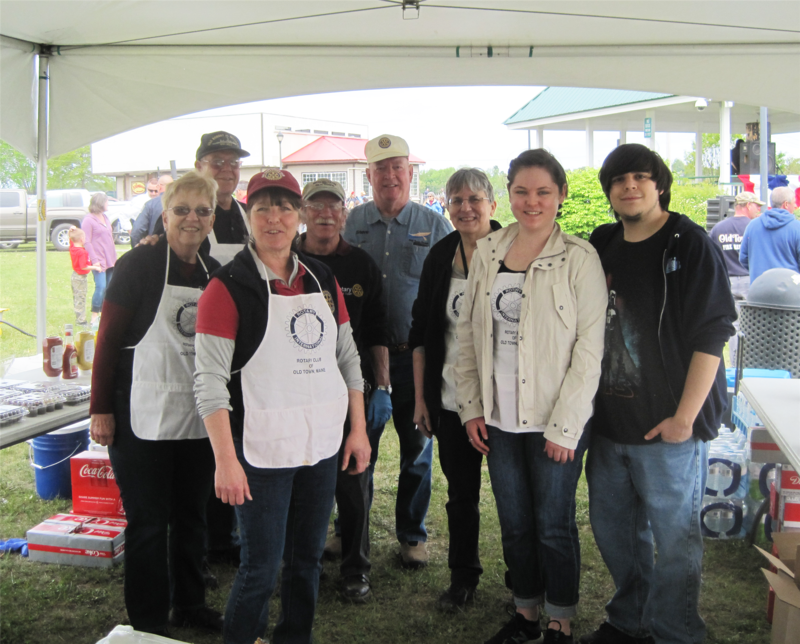 The Old Town Rotary Club cooked hot dogs and served ribs, pulled pork, and other delicacies at the Memorial Day parade at Old Town's Waterfront Park on May 28. The barbecue was cooked by Rick and his crew from Big Dawg, a catering group from western Maine. The Rotarians mixed several vats of cole slaw by hand--literally, using finger-powered latex gloves to combine finely sliced cabbage and carrots and salad dressing to make cole slaw. Also on the menu: chips, LaBree's mini-cupcakes and whoopie pies, bottled water, and soft drinks. Veterans ate free; the cost to the public was $5 per person or $15 for a family. In addition to the parade, the Memorial Day event included a very fine rendition of the National Anthem, ceremonies led by local veterans' groups with the flag at half staff, and the playing of Taps to honor veterans of all wars. Steve Russell and Steve Johnston (they call themselves "Steve Squared") cook hot dogs.